Hello Christmas Tree of my Dreams!! 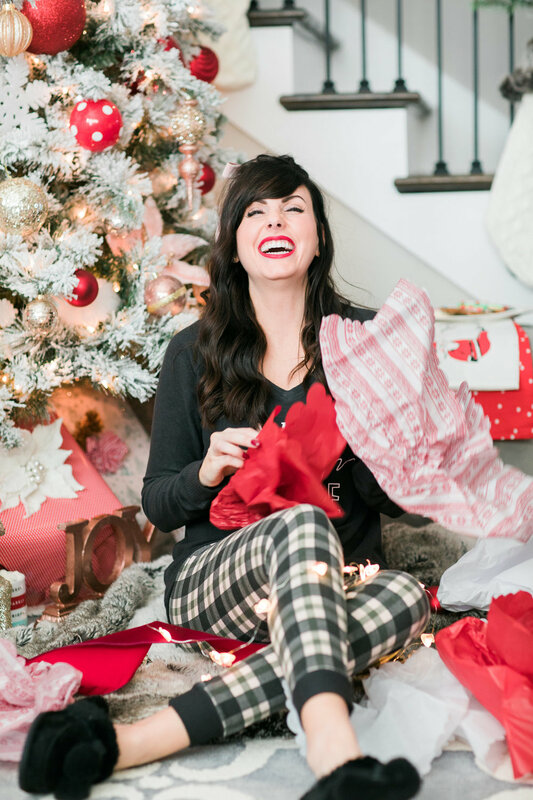 If you saw my latest IG TV, you know I’ve always loved rose gold and especially love red and pink together - and having it on my Christmas tree is no exception. For more on where I got the inspiration to dream up this tree and how I started click here. I love this pink and red decorated flocked tree so much, that I didn’t feel the need to create a whole new look this year. Besides, who has the money or time to re-do their Christmas tree every year?! Not I! However, you can give the same decorated tree a fresh look every year by changing out one element or adding in a new element. 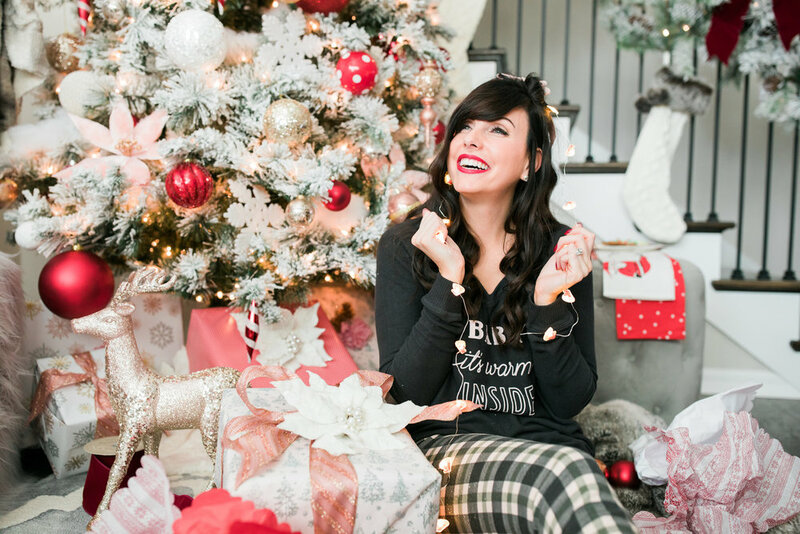 Click here if you missed my IG TV Christmas Tree Decorating video for same major Inspo! 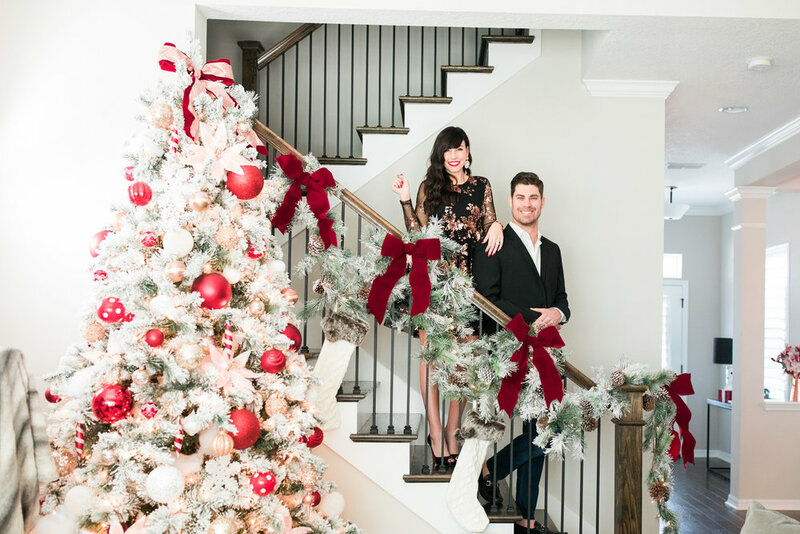 For our 2018 refresh, this holiday season we had the main wall behind the tree wallpapered and added a modern electric fireplace which created a whole new cozy glam vibe as compared to last year. I also added the same pink ribbon on the tree topper bow, to the centers of the bows on the surrounding stairway garland. Besides being a tree I don’t think I’ll ever get sick of, One of the best things about this tree is if you’re a gal on a budget, you can totally replicate this tree. 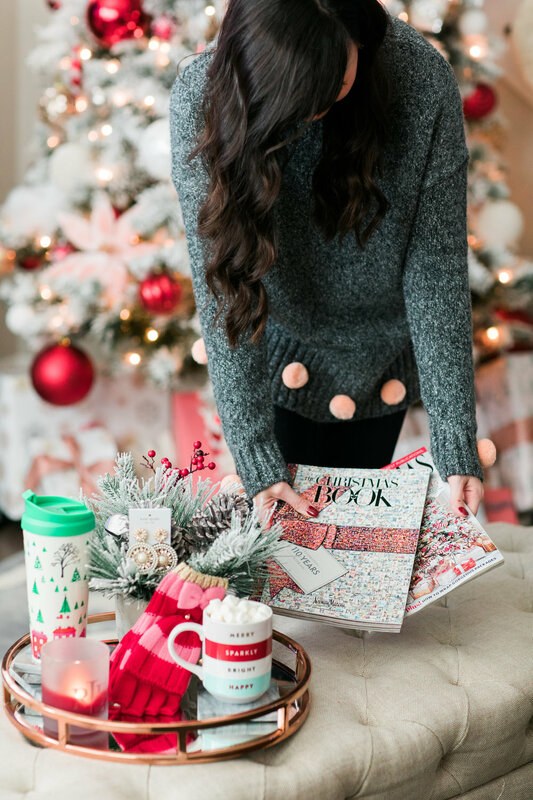 You’ll definitely have an investment to make up front but in comparison to the expensive catalogues and boutique Christmas stores, this look is very affordable. Plus you’ll want to keep this decor for years to come! I found almost everything on my tree, including the actual tree, 50% off at Hobby Lobby. Each season they put their Christmas stuff (even the new) on sale. 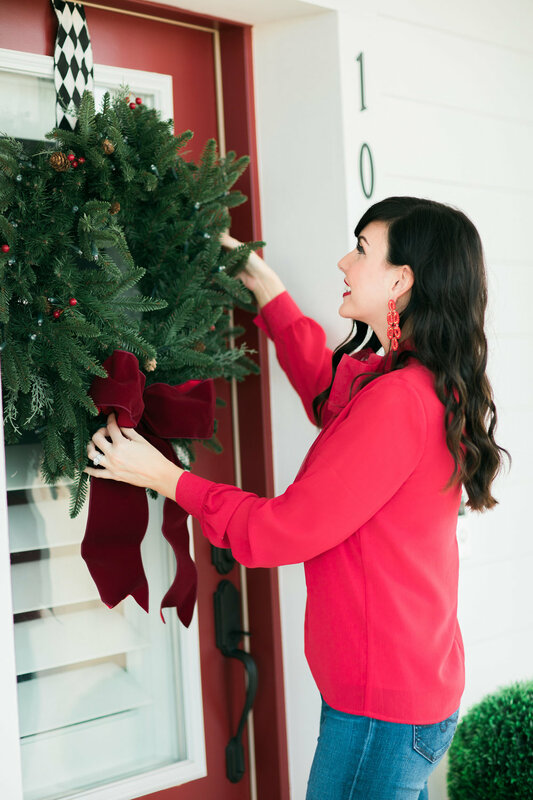 I bought the tree and all of the ornaments last year and everything held up wonderfully using the storage containers I purchased last year - for more about the storage boxes click here. It was soooo easy to redecorate this year because everything was in tact and organized. Add in a few things from Homegoods and some beautifully wrapped presents under the tree and you’re golden girl! Let the countdown to Christmas begin! Who Stole the Cookies from the Cookie Jar?! Busted can't be trusted! Cookies, for Santa...I think not...Sorry not sorry! lol You caption this post. I had so much fun taking these photo's with Katelynn! 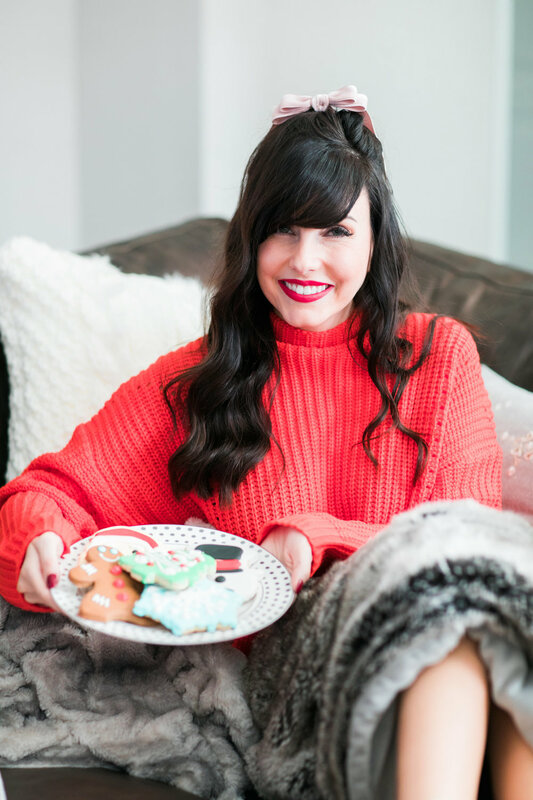 We were both feeling ultra festive, and not going to lie, these cookies were really tasty! And they are so cute. I found them at the Fresh Market. 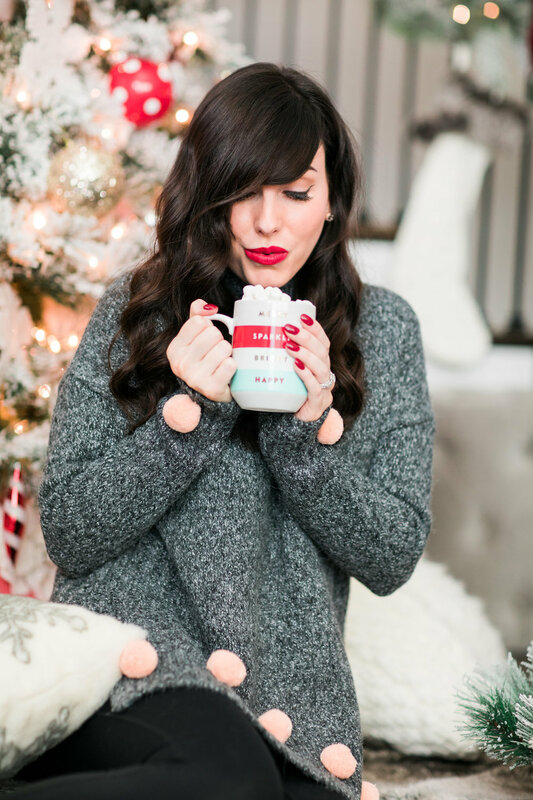 :) Anyways, this red sweater is so cozy to snuggle up in and watch Christmas movies or listen to some Christmas music by the tree (The sweater is under $30 too!). 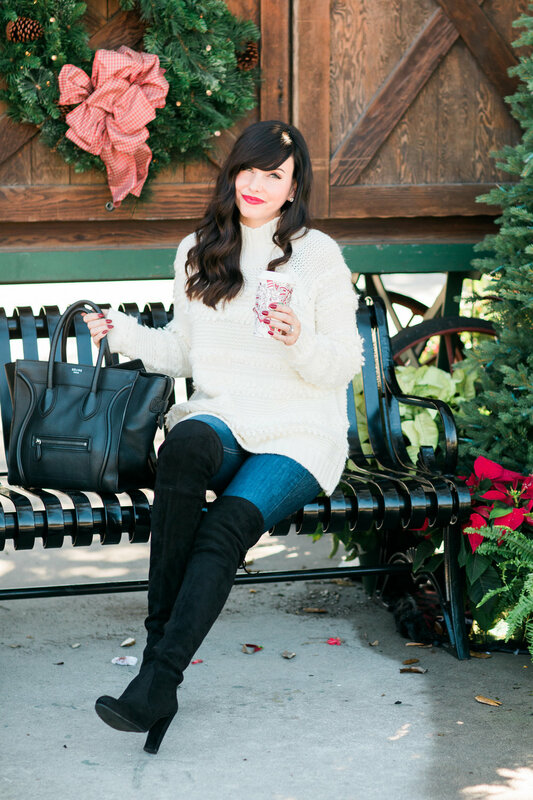 I've got my outfit info, as well as some of the cutest sweaters for your Holiday included in this post! Almost everything's on sale right now! And how gorgeous is this grey ombré fur throw BTW?! It is sooo soft! Yes indeed! I am so in love with our tree this year. I saved up for a white flocked tree and found an amazing deal on this one from hobby lobby 50% off. So worth it! It provided the perfect wintery wonderland, white back drop I was looking for this year. 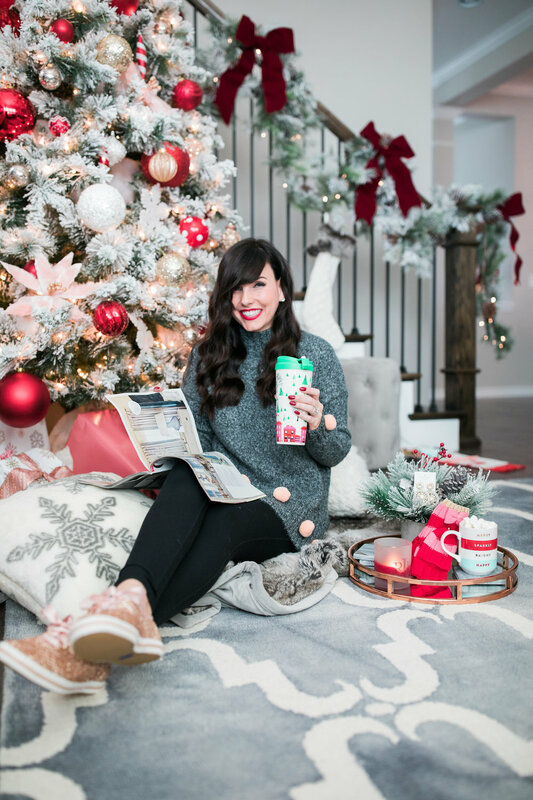 I actually struggled for a bit figuring out how to decorate our tree this year (which many of you know if you watched my Instagram Story where I asked for your tips, tricks and advice). I struggled because I knew I wanted to do something different, but that I also loved, and that combined multiple styles like, whimsical, yet classic, yet glamorous and luxe. So I thought how am I ever going to pull this off? I started with dreaming of the color scheme I would use. Do I stick with neutrals like gold, silver and blush tones? 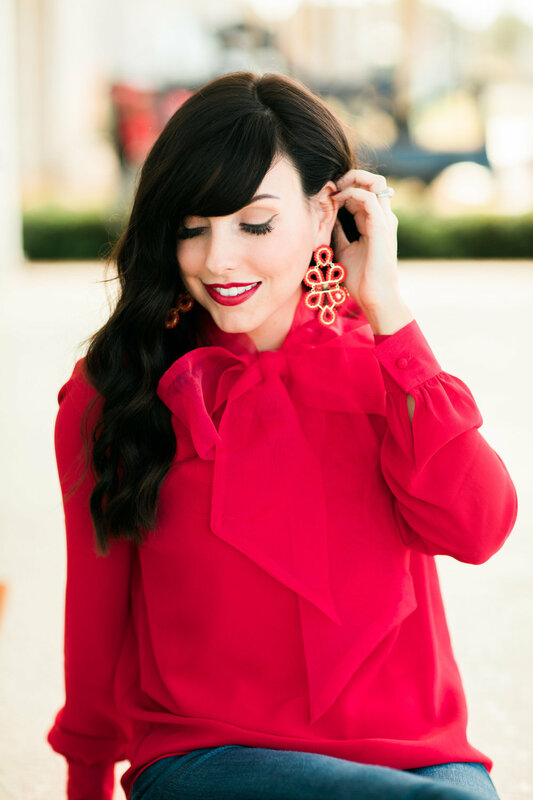 Do I do pops of red? What about copper/rose gold, as that's what our design elements are in the kitchen, directly across from the tree in our living room. As I looked through Pinterest and Christmas catalogues, it suddenly clicked with me. I was reading Better Homes and Gardens "Christmas Ideas 2017", and on page 8 there is a quote from blogger Michael Wurm (@inspiredbycharm) and it says this. "Always, always, always use what you love and what makes you happy. Don't stress about the decorating. Christmas is such a special time-enjoy it." So there it was. Just like that, I had clarity and direction. I was heading straight to the shops to search for rose gold pinks and pops of red. I found most of my ornaments at Hobby Lobby on special 50% off, and the velvet blush pink poinsettias at Michael's. The Red velvet ribbon I found is from Grandin Road and the rosey pink/coppery ribbon from Hobby Lobby. Now how was I going to tie it all together in this fairytale like dream I was dreaming of. I started with the ribbon. 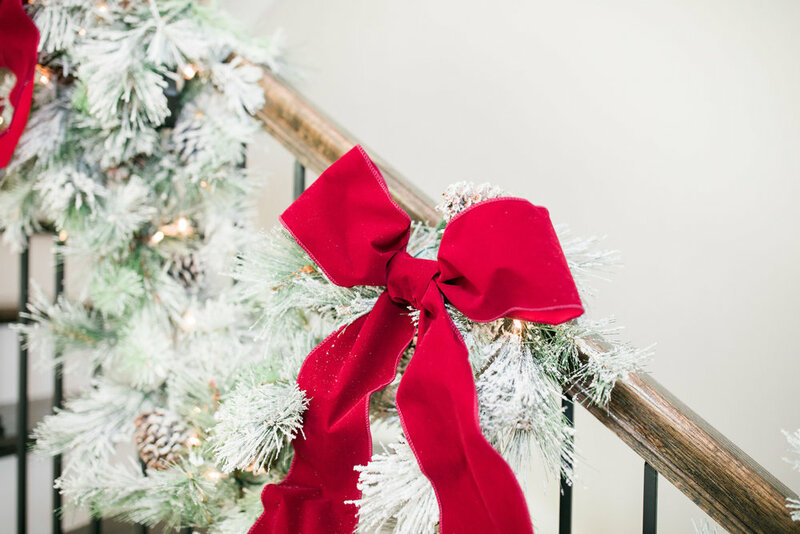 Being the red velvet ribbon is on the stairs garland next to the tree, I wanted to stick with that same solid color ribbon. I needed to add that sparkly blush glow and jazz it up a bit from a plain ribbon, which is why as soon as I found this Rose copper and gold striped ribbon, I knew I loved it and was going to tie it with the red velvet as one piece, used as the bow on top of my tree. From there I started my ornament hunt. To add whimsical flare, I opted for different sized large-medium-small red ornaments. I picked large solid ones for the classic look, and sparkly ones to add the touch of glam. The medium red ones I found either have different texture or shape to create interest. I am obsessed with the red and white polka dot medium sized ones I found as I know that adds that fun whimsical element. To gain classical charm, I opted for staggered large white glittery snowflakes, and different sized white ornaments. This tied in nicely by staggering with the sparkly-glam rose gold and blush pink ornaments. A tip is to stagger different sizes and colors next to each other, like I've done here. Last but not least for that touch of luxe personality...the Blush pink velvet poinsettias. I also used the leftover ribbon to tie bows around the presents under the tree. I think it brings it all together and beuatiful wrapping paper adds for that extra wow factor under the tree. So there you have it! I love the way it turned out because I followed my heart and used what I loved-what inspired me. Many may judge and say pink and red don't go together but I would disagree. To me they are like fire and ice. That perfect combo that when put together, is pure magic! I hope you enjoyed reading this and I would love to hear from you all! Merry Christmas, and whatever you decide to do with your tree this year, do what you love and enjoy it! 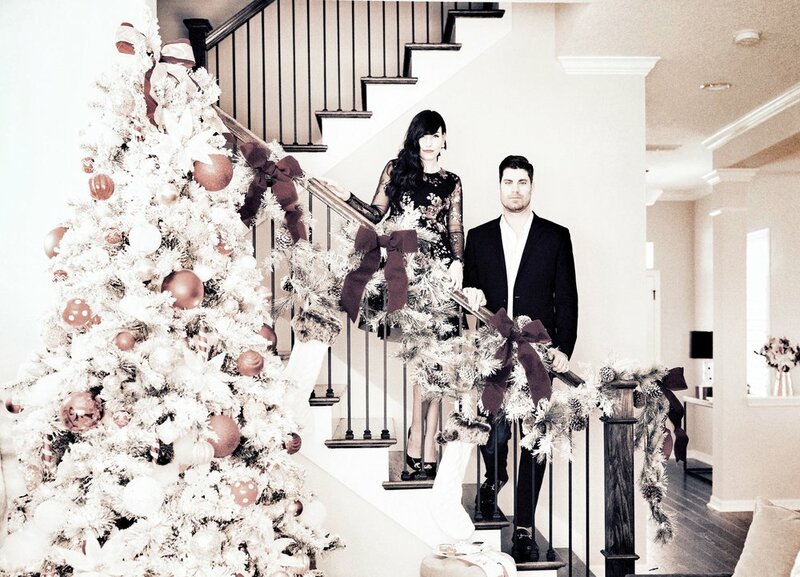 PS- I found the stockings from Michael's and the pre-lit garland from HomeGoods, if you're wondering!